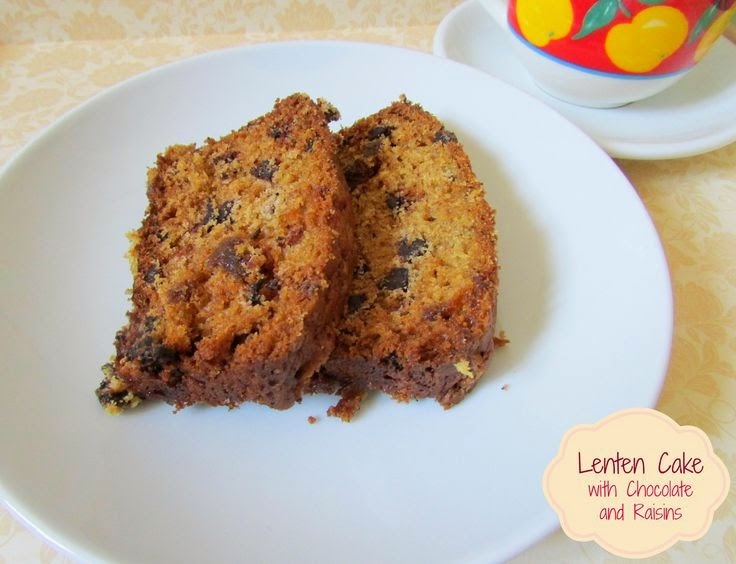 Lenten Cake with Chocolate and Raisins!!!! Easter is almost here and of course for the most of us this week is a week for Lenten! But at the same time we can enjoy a delicious cake with chocolate and raisins inspired by the recipe here…so are you ready? Preheat over to 170degrees C. We are going to use two bowls, one for the liquids and one for the solids. In the first bowl mix up the liquids. In the second bowl mix the solids. Add the liquids and keep mixing with a spoon. When the mixture is ready, add it in a baking tin and cook it for 45min-1hour. Just keep in mind that you must not open the oven before 45mins to pass, because the cake will loose its lump. It only takes 5min to prepare it, almost an hour to be cooked…and 15min to eat it all!!! !